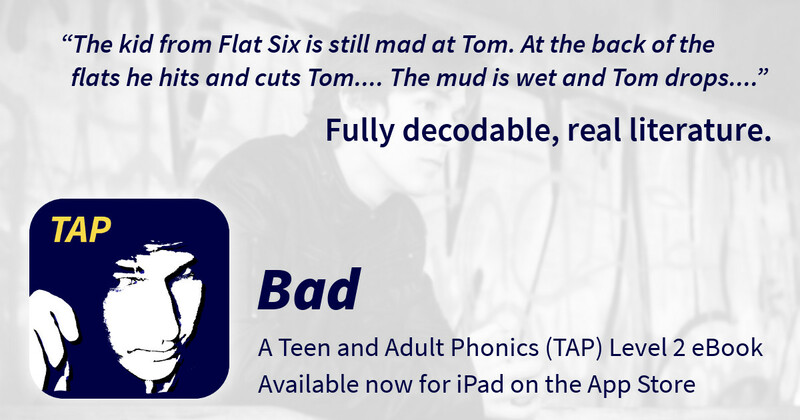 Today we released the first decodable book app in the Teen and Adult Phonics (TAP) series for iPad, entitled Bad, on the App Store. It’s the story of a teenage boy, Tom, and his mother adjusting to life in a new home in a rough London neighbourhood. This app is designed to deliver a dignified, confidence-building book-like experience to a very specific and under-served group of learners, [particularly] teens and adults with severe dyslexia, ASD and ADHD. The functionality of the app supports this experience and is simply not available in [conventional eBooks]. For that matter, most of these features are not available in ANY phonics app currently available on the App Store. In some ways, it’s good that this app gives the impression of being a regular eBook because we didn’t want older readers to have the impression they were being handed yet another levelled reader or, worse still, a “baby book”. We really hope this app finds the audience for whom it is intended and would love to hear from teachers and tutors who use it in their work with adult and teen emergent readers. Update: It’s October 2018 and more and more people are find their way to the TAP Library. We’re even getting great feedback from teachers, parents and grandparents like this review from a woman who found our decodable books for older students to share with her adult grandson. Dyslexic artists wanted: let TAP showcase your talent! CVC readers for older students? Decodable drama in “The Plan”. Viagra generika on What is Blending? levitra online pharmacy canada on What is Blending? Yes, I want to know when new TAP titles come out! Subscribe to our mailing list and never miss a new title. Digital decodable novels for teens and adults. Supports instruction in synthetic phonics. Built for dyslexic learners.